This morning I wanted to talk about an idea that I have for my new master bathroom. For me the bathroom is a very important place. I spend large amounts of time there taking my time to get ready, I love bathing, and I feel that its a place that we can go and lock the doors without interruptions. The idea that seems to stick in my memory bank was inspired by a photo that for the life of me I can't find anymore. 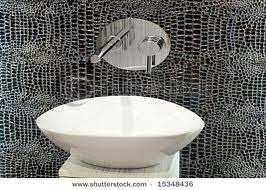 It is basically a wall of glass mirrored mosaic tiles in a small bathroom hung in a very curved design as opposed to straight even rows with a round mirror hung in the middle above the sink. If any fellow bloggers know this image I would love to see it again. PLEASE HELP. None the less, I love the curved design idea but for my master bathroom I would either hang two separate mirrors for each sink which gives me so many options as far as the style goes, or I would hang one single rectangular mirror that spans the vanity. For that detail we shall see. This is a big decision and comes with some risks, but it would make the small space feel enormous and would bring in so much texture and light. I also feel that since there are views of the bathroom from the bedroom when the door is open, that it would make a statement as art and would add so much visual interest. I'm not sure how I can say no to the thought of it. Now I just need to see how much these suckers cost! Hi, Whitney! Did you ever find these mosaic mirrored tiles? I've been wanting to create a unique mirror for my formal dining room with these mirrored tiles, but I haven't been able to find them. Hi Larenda, I actually decided to go with marble throughout that bathroom. I need to post the finished results and will do so soon! I did see a blogger called signedbytina who seems to have this in her kitchen. You might want to reach out to her and see if you have any luck! Good luck to you and let me know if you do find it, I was and still love this look even though I didn't go with it. 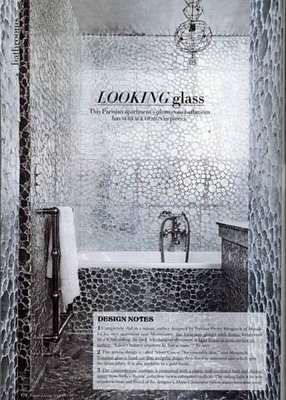 You’re right – it’s quite the design risk to use a big amount of mirrored mosaic tiles in a bathroom, but I think it’s a risk worth taking. Mosaic tiles are very popular design ideas, since they can create a very dramatic effect or a very creative picture, depending on how you want to use them. 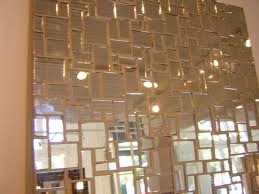 Using mirrored tiles in a room would not only be great aesthetically; it would also be quite cost-efficient. 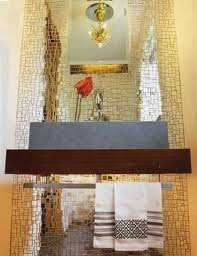 You may choose to make use of low-watt lighting options because the light can be reflected off of the mirror tiles and spread and bounced across the room, making the light seem stronger and brighter than its wattage dictates.